The cast-iron bridge over Cound Brook was built in 1813 to a design approved by Thomas Telford, then the County Surveyor of Shropshire. 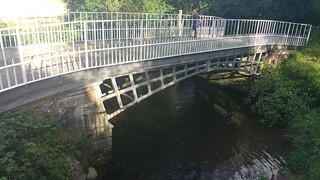 This is the only Telford approved cast-iron bridge remaining in situ Shropshire. The bridge was bypassed by a concrete bridge in the 1970s, but is open to pedestrians and is in the care of English Heritage.